The Ptolemies, the Greek kings of Egypt, ruled Egypt for 300 years. But by around 50 BC, the Ptolemies were much weaker than the Romans. The Roman leader Julius Caesar started to think maybe the Romans could conquer Egypt. When Julius Caesar visited Egypt to check it out, the Ptolemaic (Greek) Pharaoh of Egypt, Cleopatra, begged him to help her. 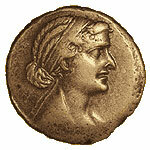 She wanted Caesar to help her fight a civil war against her teenaged brother and husband, Ptolemy. Julius Caesar did help Cleopatra get back into power, but he left Roman troops all over Egypt. Caesar also took Cleopatra (klee-oh-PAT-rah) back to Rome with him as his girlfriend, where they had a baby. (He was 52 and she was about 18.) When Julius Caesar was assassinated in Rome in 44 BC, Cleopatra went back home to Egypt. 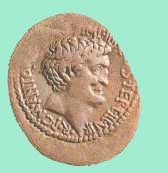 But she didn’t go alone: she took another Roman leader, Mark Anthony (who was closer to her age, and also her next partner). Cleopatra ruled Egypt for another fourteen years, raising three more children with Mark Anthony. She ran her country successfully. And she also managed Roman politics so Egypt could stay independent. By this time Cleopatra was almost forty years old, and Mark Anthony was fifty-three. But in a civil war between Julius Caesar’s nephew Augustus and Mark Anthony, Augustus finally defeated Antony and Cleopatra. After their defeat, they both killed themselves (or maybe Augustus killed them) in 30 BC, and the Romans took over Egypt. Why did the Romans want Egypt? The Romans valued Egypt very highly, because it was so fertile and produced so much food. Roman tax c0llectors took a lot of that Egyptian food, especially wheat for bread, from Egypt for taxes. The Romans sent it to Rome on big ships. How did the Romans run Egypt? To make it easier to collect these taxes, the Romans also established Roman-style government in Egypt, though the main language of government was still Greek (the way it had been under Greek rule) rather than Latin. By this time even most ordinary people in Egypt knew some Greek. Gradually people stopped writing hieroglyphs and wrote mostly in the Greek alphabet. Egypt’s long tradition of scholarship continued through the Roman period with the astronomer Ptolemy, the Jewish philosopher Philo, and many other researchers working in Alexandria. Around 300-400 AD, most Egyptians converted to Christianity. There were bitter battles over exactly which kind of Christianity, Arian or Catholic, would be observed in Egypt. When Rome fell to the Ostrogoths in 476 AD, Egypt’s grain was sent instead to the new Roman capital at Constantinople, near the Black Sea, in what is now Turkey (modern Istanbul). What happened to Roman Egypt? The Romans held Egypt until the 600s AD, for about 700 years, until the Arabs conquered it. Egypt in Late Antiquity, by Roger S. Bagnall (reprinted 1995). Cite this page: Carr, K.E. Cleopatra and the Romans in Egypt. Quatr.us Study Guides, June 17, 2017. Web. April 20, 2019.